There are many great things about thrift stores and flea markets—the hope and excitement of the search, the thrill of finding exactly what you’re looking for, the joy of a bargain, and the satisfaction of helping a worthy cause or simply shopping in a sustainable way. Chicago is blessed with some great places to experience that roller coaster, and here are some of the best. Held one weekend per month inside the Beaux Arts Plumbers Hall at 1340 West Washington and at the 1350 block of West Randolph Street (there are two entrances), the award-winning Randolph Street Market is home to the Chicago Antique Market, Indie Designer Market and more, featuring hundreds of vendors selling antiques, vintage clothing, and art. 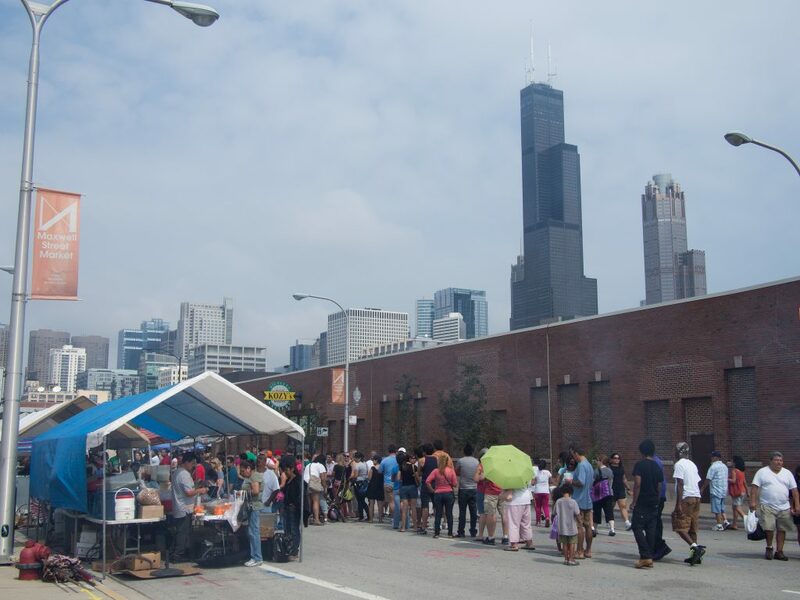 There’s an admission fee as the city does not subsidize the event, but there are bargains to be found, as well as a variety of food and drinks to enjoy. Although it no longer takes place at its original location on Maxwell Street, this market has over 100 years of history. Originally started by immigrants in the late 19th century, it’s still a multicultural affair with all kinds of international and authentic knick-knacks available and music and performances providing a pleasant atmosphere. It takes places year-round on Sundays, and a real highlight is the amazing Mexican street food. Once a month from April to October (look out for a seasonal Holiday Market in November too), around 100 vendors fill the first three levels, ramps and all, of a parking structure in Uptown and call it Vintage Garage Chicago. A variety of vintage ware is on offer, but each market has a loose bonus theme, such as Rockabilly & Vintage Clothing Show, Vintage Wedding, and Retro Chicago. Entry is $5, and many customers dress the part. Not far from the United Center, Second Chance Thrift is not only a great thrift store, but it’s also for a great cause as it’s the store of the ReVive Center for Housing and Healing, a not-for-profit organization committed to fighting homelessness in Chicago. The store offers a tidy and organized range of branded clothing, household items, and unique collectibles at bargain prices, and the staff is passionate and friendly. All clothing is half-off on Tuesdays. In 2014, sisters Zakiyyah and Shaakira Muhammad opened The Silver Umbrella, the thrift store they felt the students and locals of Hyde Park were wanting. Offering a place where people can buy and sell designer and better quality new and gently used clothing, footwear and accessories, the store has gone from strength to strength since. Its name came from Zakiyyah’s daughter, in case you were wondering. Over in Portage Park, Thrift & Thrive is a store with an emphasis on green living and community. It was the brainchild of Melissa and Joseph Basilone, who opened the shop in response to the effects of the financial crisis, recognizing the wider need for affordable, gently used clothing and goods. The store was revamped in early 2017, with an expanded showroom to better display the collection of household goods, vintage clothing, books, records, movies, and more.